Last week my sisters and I traveled to Ireland, a trip over a year in the making, and my first vacation since becoming a professional. Last March, our Irish-American grandma passed away and left the grandkids a little bit of money for each of us. Growing up it was my dream to take her to the country where all of her ancestors came from, so I quickly decided that I would be going to Ireland to honor her and her memory, and my sisters joined me. 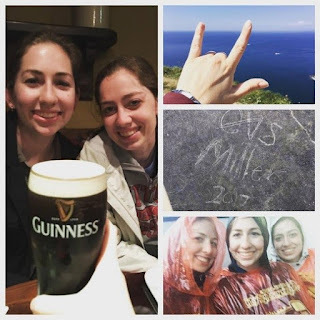 On Sunday, May 7th (the day after my youngest sister graduated from college), the Miller girls began their adventure flying from Kansas City to Philadelphia and then arriving in Dublin Monday morning. We had a whole week planned traveling across the country all on our own. We had organized the trip day by day and we were able to visit multiple cities, try a variety of food, explored castles, and made many memories. Our first day was dedicated to exploring our home base of Dublin. We made our first stop at the Irish Family Heritage Centre and met with a genealogist to learn more about our ancestors. Then we visited Trinity College and took a two-hour walking tour of the city. The next day we went up to Northern Ireland to visit Belfast – home of the Titanic museum. Our next two days were train trips to southern Ireland to visit Cork (home of our ancestors) and Cobh harbor (where our ancestors boarded their ship to come to America), and to western Ireland to visit Galway and the Cliffs of Moher (where I discovered a new fear of heights). Our last day was another day exploring Dublin, visiting the Kilmainham Gaol, the Decorative Arts & History branch of the National Museum of Ireland, and ended the day with a two-hour open bus night tour of the city (which happened to be the only time it down poured our entire trip). This trip was a great way to celebrate my Grandma, and our Irish history. While she was not there in person, her spirit shown through with the sun we had every day. I am so glad my sisters and I were able to take this trip together and create lasting memories, even though it made going to work on Monday more difficult. Now that I am back in the office, I am glad I was able to take this trip and take a week vacation. This first academic year was a whirlwind, and a mental break was needed. Now, I am ready for the summer and for New Student Enrollment to start and begin my second year as a professional.